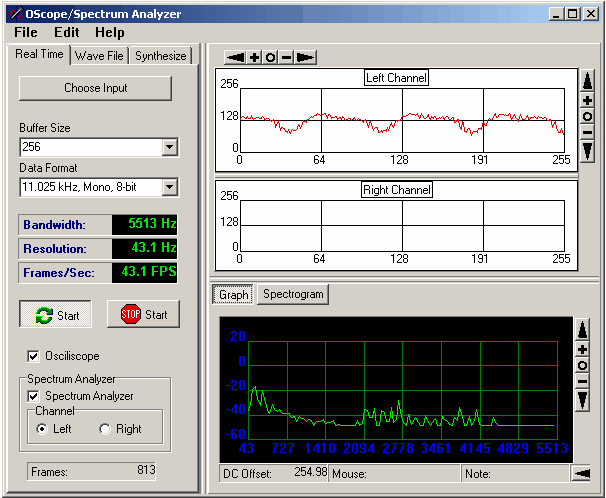 Spectraciser allows you to do audio signal analysis using your computer's sound card. It can do real-time analysis of a "live" signal fed to your computer. It can also do static analysis of an Audio Wave file. Depending on the Sample Rate and sample size, it can do bandwidths of 5.5 to 22Khz. It has a frequency resolution of between 43Hz and 0.3Hz. It also displays oscilloscope signals of the incoming waveform. Finally, it can synthesize complex wave forms and analyze them. 1. Real Time Spectrum Analysis. With the Real-Time analysis option, you bring the audio into your computer through the sound card. Signal can be in the be in audio frequency range from about 20hz to 22Khz, depending on your sound card. a. Spectrum Graph. The Spectrum Graph displays an analysis of the current signal. Every signal is a combination of one or more sine waves. Each peak in the graph represents the frequency of one of those sine waves. By looking at the peaks, you can determine the combination of frequencies that are contained in the signal. Using the cursor, you can determine the exact frequency of each peak. If you analyzing music, you can determine the musical note represent by a peak. You can zoom and pan the graph so you can see the details and make precise measurements. The bandwidth, frame rate and resolution are controlled by buffer size and the sample rate. The bandwidth can range from 5,513 Hz to 22,050 Hz. The Resolution can range from 43.1 Hz to 0.3 Hz. The Frame Rate can range from 43.1 Frames per second to 0.3 Frames per Second. b. Spectrogram. A spectrogram displays the changing spectrum over time. The spectrogram to right shows 4 seconds of time. The yellow and red spots on the graph show peaks in the spectrum. You have a choice of different color schemes and you can even create your own color schemes. You can also adjust the time period displayed. c. Oscilloscope. The oscilloscope shows the raw signal from the input. It shows the amplitude and the sample number of the sample. If the signal is stereo, there are two graphs so you can see both channels. You can pan and zoom to see the details of the signal. The program also allows you to read Windows WAV files and analyze them. You can pick out individual sections of the file for analysis. The WAV file data will be displayed in the Oscilloscope section and you can pick specific sections of the sound for analysis. The blue lines in the image above show a section of a file that has been selected for analysis. This can be very useful to musicians for dissecting a song to figure out exactly what notes are being played. The program can also play the selected section of the sound to make sure you have chosen the right part of the sample. Virtually any wave form or sound can be constructed mathematically. Spectracizer also allows you to generate mathematically generate complex wave forms and analyze them. Base Wave. The Synthesize option allows you to generate Sine and Square waves of any frequency as the base wave from. These frequency can then be swept between the base frequency and another frequency. Modulations. The Base Wave can then be modulated by another sine wave of any frequency. The modulation can by addition, multiplication and frequency modulation. You have control of the amplitude of both Base Wave and Modulator Wave. You have control of the DC Offset of the Base Wave. Playing Synthesized Sounds. Finally, you can the sound synthesized sounds through your computer's speakers. The sounds generate interesting, "Science Fiction" sound effects. The image to the right shows a complex wave from generated with the synthesizer. As you can see, the sound is very complex and it produces a sound similar to laser pistol you see in SciFi movies. The image to the right shows a spectrum analysis of the same complex wave form displayed above. As you can see, the wave form consists of a low frequency component, a high frequency component and a single frequency spike in the middle. The program is free of charge and does not contain any advertising or limitations. You are free to use it however you see fit. However, you may not repackage or sell the program.